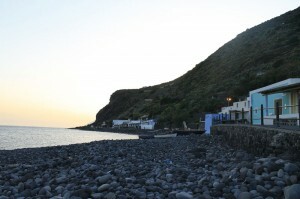 Far from the most navigated routes, if you land on Filicudi, it is only for choice, or even better for the desire to immerge into a pristine and wild nature, where typical beaches, but also little and cosy coves, transform the island into a unique scenery. Undoubtedly, the sea is one of the principal attractions, and the principal support of the island. To fully enjoy all the beauties of Filicudi it is advised to use a boat, necessary to reach evocative glimpses, as Grotta del Bue Marino; in past it was thought to be the hiding place of marine monsters, because the rays of the sun created particular light plays. If you have no boat, do not worry; there are a lot of places where to hire it, or to make a guided tour along the coast. Another evocative corner hidden by the sea is La Canna rock, which according to the islanders is said to have the shape of Madonna with the child. This rock is shaped by sea and fire, and rises in all its might upon the island, giving impression to protect it. According to a “Filicudian” legend the rock has magic powers: it is enough to touch the rock to make your desires come true. The beaches are constituted of rounded pebbles; the most famous is that of “La Punta”, reachable from the pier on foot. As an alternative there are those of Pecorini sea and the Port’s beach. La Spiaggia is situated in the southernmost point of the island and is reachable on foot; it is enough to go along a picturesque path from Filicudi Port. It is about a beach covered with round pebbles of a clear volcanic origin, bathed by limpid, crystalline and blue sea, with a seabed which subsides a few metres away from the shore. The beach of Pecorini is situated on the southern side of the island, in front of the typical fishers’ village of Pecorini a Mare. It is a stretch of black pebbles surrounded by a clear and deep sea, with traditional Aeolian houses in background. The beach has no bathing facilities, and is often occupied by colourful boats of fishers; it is one of the most picturesque glimpses of the island. 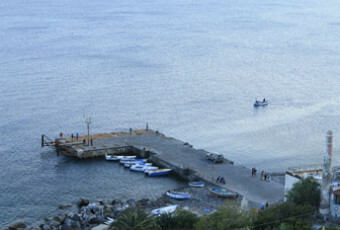 It is about a beach situated on the southernmost point of the island, in the wide creek east of the Port of Filicudi. 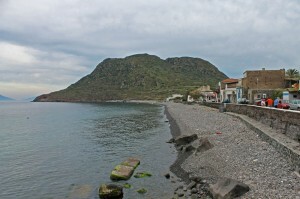 It is a beach of dark volcanic pebbles with a narrow shoreline, some hundreds of metres long which extends in parallel with the village’s promenade, easily reachable on foot. The sea, where the beach del Porto arises, is blue; its seabed becomes rather deep, a few metres far away from the foreshore. The beach has no bathing facilities, but some steps farther, you can find traditional restaurants and a grocery shop. The beach of Capo Graziano extends in the southernmost part, and is surely the most beautiful and typical of the whole island. Situated on the Capo Graziano promontory it is connected to the rest of the island by the strip of sand, 500m large, covered with rounded pebbles of volcanic origin, and surmounted by a little hill, where in past the namesake village, dating back to the Bronze Age, was situated. It is still visible thanks to the ruins of 25 huts. The sea, of an intense blue colour, which bathes the beach, breaks on the east upon enormous rocks, hiding evocative coves, to be discovered by boat. Besides all, the adjacent area, famous for innumerable findings, dating back to the Bronze Age, is considered one of the vastest areas of prehistoric settlement of the whole archipelago. To make the circumnavigation over the island surely is an experience that none visitor should miss. You will remain surprised by magic glimpses, and by beautiful landscapes which the evocative coastline reserves. Moving from the Port of Filicudi towards north, you will immediately notice a steep wall, representing according to geologists, the internal slope of a volcanic cone, almost corrupted by the erosive action of the sea. Looking up you will notice the village of Valdichiesa with its traditional white houses which harmonically contrast with the luxuriant vegetation. Once passed Valdichiesa you will find yourselves next to a beach, principally covered with pebbles where you can see a couple of houses, even if it is a very isolated zone: you have already arrived to Brigantini. The next stop is Zucco Grande, where the volcanic nature of the island is evident, thanks to its wall’s observation: it shows the stratification of lava scoria. 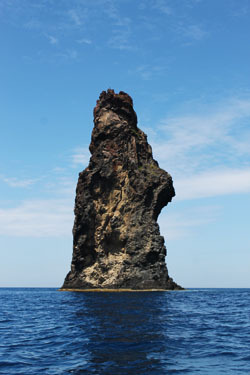 The next stop is Giafante rock, a very characteristic glimpse not only because of the shape reminding an ancient tower, but also because of its rocky coast. On the horizon you will notice the lighthouse of Punta Zotta, surrounded by little creeks and coves. Going forward for a little more than 1km, in the south-eastern direction, you will find yourselves near to La Canna, an imposing stack of basaltic rock, of the height of more than 70m, formed by magma solidification inside the carter, and thanks to the cone erosion of more soft consistence. This rock is shaped by sea and fire, and rises in all its might upon the island, giving impression to protect it. According to a “Filicudian” legend the rock has magic powers: it is enough to touch the rock to make your desires come true. At this point you can also observe Scoglio della Fortuna, and the amazing Arch of Punta Perciato, a lava promontory, where the erosive action of the sea opened a passage. In the southern direction you can see the famous Grotta del Bue Marino: in past it was thought to be the hiding place of marine monsters, even if it actually was the shelter of Mediterranean monk seal. Unfortunately today there are no these animals anymore, but it is worth the effort to visit this vista for wonderful plays of lights. 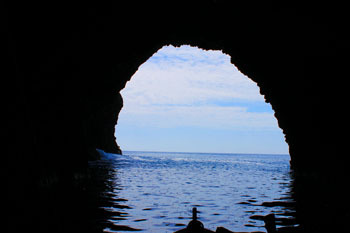 The cave is 30m large, and thanks to the vault of 20m it allows the boats to enter it. Now only one step divides you from Costa dello Scairato, a bleak wall crossed by a gully where the crater of the Fossa delle Felci poured its lava scoria in past. Once passed the Sciara, it is the right moment to dive into green waters of Grotticelle di Punta Stimpaganto, one of the most beautiful points of the island where to swim. At this point the coast evolves into a little pier of Pecorini Sea, the place of a traditional fishers’ village, to mightily re-emerge then with a rocky formation called Filo di Lorani, till Le Punte Beach. Our tour finishes in Capo Graziano, the seat of a settlement dating back to the Bronze Age. In this stretch the coast is steep, inaccessible, and full of creeks. Watch out for a Shallow del Capo (-2,5m), famous for various shipwrecks in course of millennia. This site is also well-known for the institution of the archaeological underwater museum, which today constitutes one of the principal attractions of the island.